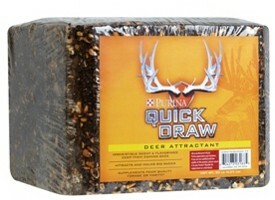 Attract and hold big bucks with Purina Mills Quickdraw Deer Block attractant and supplement available at J&N Feed and Seed. Designed to attract deer with its irresistible scent & flavorings. Designed in a 20 lb block, it attracts big bucks and helps keep deer coming back. It can also be used to supplement poor quality forage or habitat. Studies on the Primos® Quick Draw® Deer Block attractant show strong consumption, driven by a proprietary flavoring agent not found in any other deer block. Pick up all your hunting supplies, blinds, feeders, and wildlife feed at J&N Feed and Seed. We’re all hunters here, so if you have any questions, please give us a call or stop by. We’re happy to help! This entry was posted on Tuesday, September 5th, 2017 at 1:54 am	and is filed under News & Updates, Wildlife, Deer. You can follow any responses to this entry through the RSS 2.0 feed. Both comments and pings are currently closed.